Locally owned and operated, The Robin’s Nest, situated in downtown Salt Lake City, was founded on a passion for an all-American favorite: the sandwich. All of the sauces and dressings are housemade, and everything is prepared fresh daily. 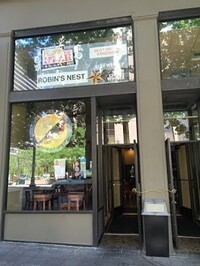 The menu offers soups, salads and more than 25 sandwiches that are all unique to The Robin’s Nest. There’s no boring sandwich here; try options like the Aloha Oink, with black-forest ham, provolone and pineapple salsa on ciabatta; or the Rooster Call, with chicken salad, red onion, provolone and sweet-honey Dijon. All sandwiches come with orzo pasta or house made chips, which can be enjoyed inside or outside, right on Main Street downtown.